John Edward “Jack” Purcell (1903-91) was Canada’s greatest badminton player and a 12-year consecutive world champion. But he is probably best known for his shoe design that was purchased by Converse in the 1970s. 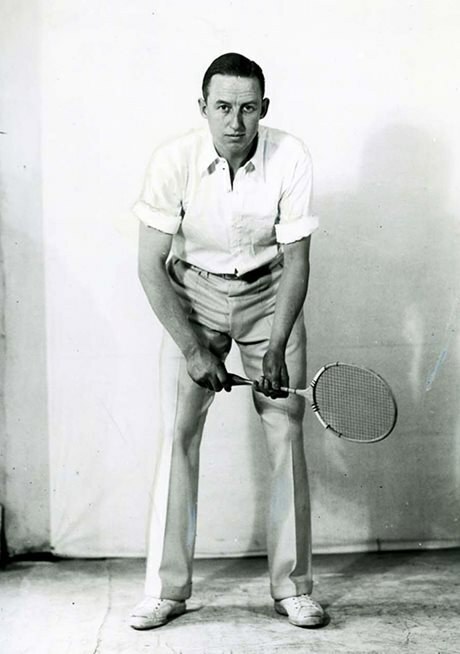 Purcell started playing badminton in 1924, and quickly proved his skill in the sport. He won the Ontario championships five consecutive times, from 1927 to 1931, and the Canadian National Badminton Championships in 1929 and 1930. Purcell also wrote a badminton column for the Toronto Star. He became a professional player in 1932. At the top of his game, Purcell was the World Professional Badminton Champion from 1933 until his retirement in 1945. In 1935, Purcell designed a canvas and rubber badminton shoe for the B.F. Goodrich Company of Canada. Converse acquired the trademark for Purcell’s shoe in the 1970s, and it became a popular casual shoe. Read more about Jack Purcell on the Guelph Public Library website. See Jack Purcell shoes by Converse. Watch a short clip of Purcell playing badminton (from the Critical Past website).